It’s time to get your hustle on! 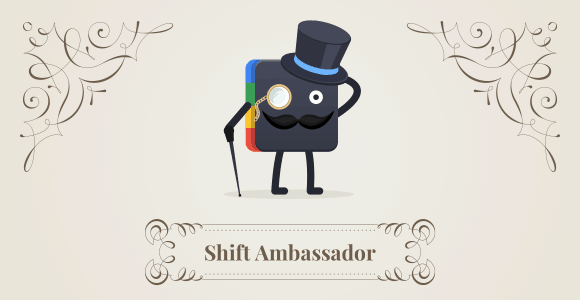 Our Ambassador Program makes it simple to start earning referral income with Shift. The best part? We’ve partnered up with GrowSumo to make it easy for anyone to get involved. Every time someone signs up for Shift Pro or Advanced, you automatically earn 20% of the sale. Learn how it works, and join our program. Once you’ve signed up, you’ll receive an email with your unique Ambassadors link. Share it on your website, social media channels, webinars, email, or however you choose. Start earning money every time your followers purchase Shift. It’s easy, and your friends will thank you. Don’t think you’re influential enough? We’d like to challenge that! Influencers and product ambassadors aren’t just social media celebrities; ours are regular people, but also product lovers, micro-influencers, and hustlers! Whether you have a massive following or just family and friends in your network, we want to reward you for sharing Shift. Ready to get started? Join today, or feel free to reach out with any questions.